World Services Group and host firm Shoosmiths welcomed 24 WSG members of the Intellectual Property Group at the WSG 2019 IP Group Meeting held on 21 - 22 March in London, England. 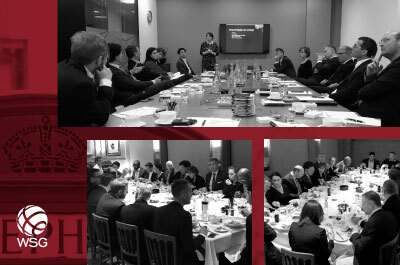 The meeting provided several valuable networking opportunities and the opportunity to discuss important topics and events across the industry. .
World Services Group and host firm Shoosmiths welcomed 24 WSG members of the Intellectual Property Group at the WSG 2019 IP Group Meeting held on 21 - 22 March in London, England. The meeting provided several valuable networking opportunities and the opportunity to discuss important topics and events across the industry. WSG IP Group members interested in gaining valuable industry information, strengthening their business relationships, and increasing business opportunities within the organization.